San Francisco is considering a ban on McDonald’s Happy Meal toys unless the fast food chain cuts down on calories and includes fruit and vegetable portions in the meals. 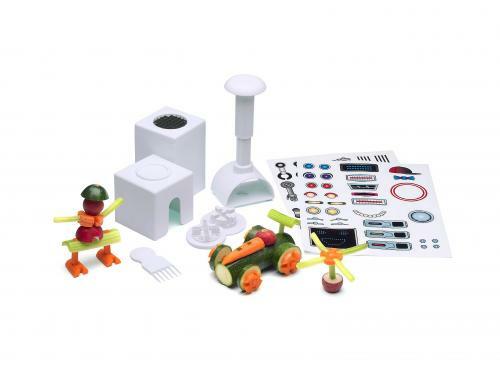 We have a suggestion for McDonald’s: use the Veggie Bot, a set of kitchen tools that transform boring vegetables into building blocks for toys. It solves all of MickeyD’s problems–the toys remain, and kids get an extra helping of vegetables, to boot. The Veggie Bot is the brainchild of Lee Bayless, an Oklahoma native who performs a comedy show on cruise ships by day. On his off hours, however, Bayless is a prolific inventor–he has garnered 10 patents, according to the Oklahoman. His most successful invention was the Lazy Dude, a combination hammock and ice chest on wheels. Bayless sold thousands of Lazy Dudes to Coca-Cola and Coors in the 1990s for promotions. If Bayless plays his cards right, we imagine that he could have even bigger success with the Veggie Bot–especially since he plans to sell prepackaged bags of the vegetable building blocks to schools and fast food chains. At the very least, it’s an excuse for kids to play with their food.